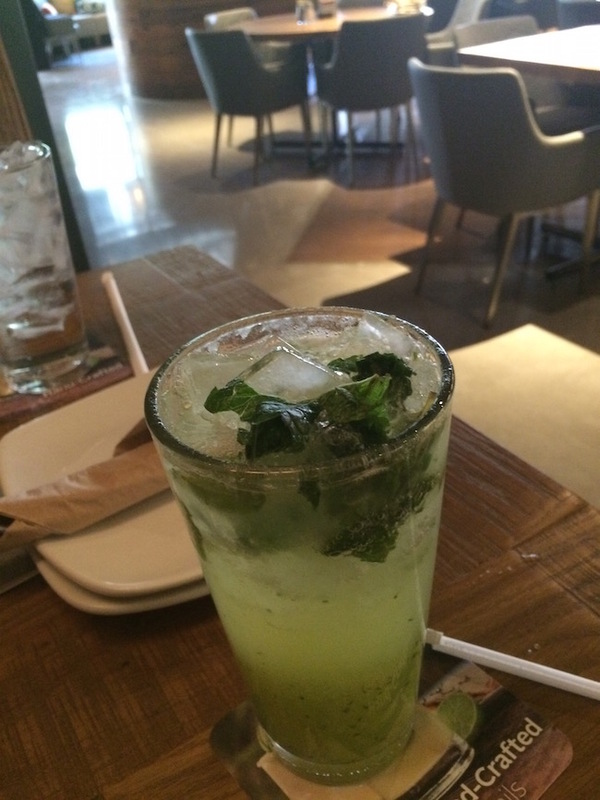 I went to Mercadito at Red Rock Resort for the first time a couple of weeks ago. I was so hungry I couldn’t take a picture of my food when it was served. 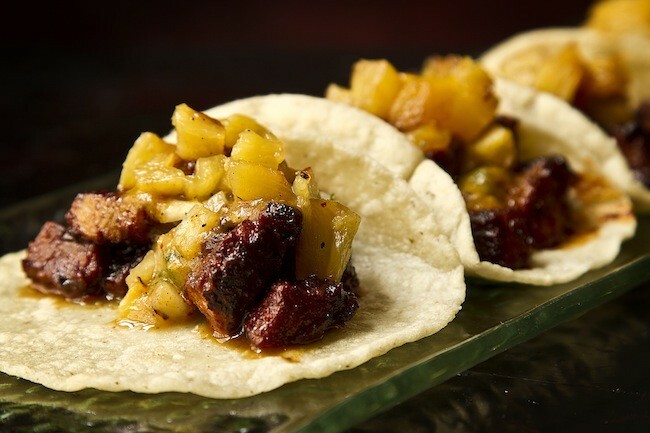 The Pastor tacos (professional photo above) were delicious – even without the pineapple. The tacos were pricey at $14.50 for a serving of four (menu) but they may have been the best tacos I’ve had. My friends were loving the guacamole, if you’re into that sorta thing. I’m not but I did enjoy some super salty chips and 3 different salsa’s with verde being my favorite. If you’re cost conscious you can find less expensive tacos at the Nacho Daddy location nearby on Sahara but you may not find a better quality taco. Mercadito has a bunch of promotions going on right now. Check it out. All You Can Eat Tacos – $19.95 on Sunday & Monday. If you’re not a big eater this may not be worth it. I was full on the four tacos with my $14.50 order of Pastor tacos. Tacos For Life – Enter contest by spending $40. If you finish 32 tacos in one hour you’ll receive the meal for free and a $200 gift card. You’ll also be entered to win tacos for life. Super Bowl – $50 for all you can eat tacos and 2 hour open bar. Open bar is basically $30 so make sure you’re thirsty. Additional buckets of beer are $15. 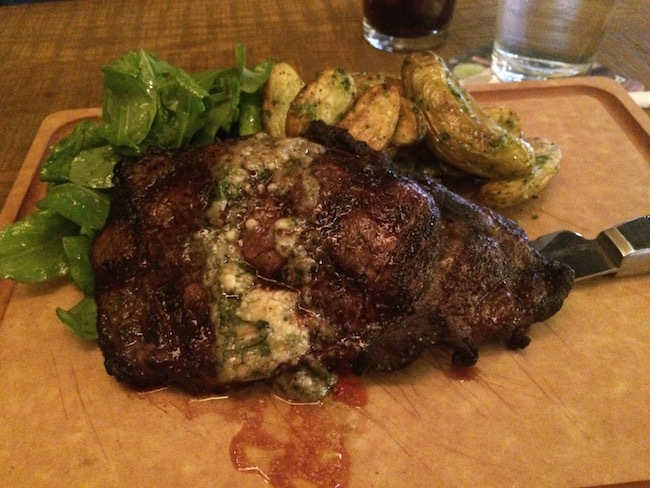 Industry People – 50% off on Tuesdays. Evidently I’m industry. HOLLA! Two Happy Hours Daily – Happy Hour 7 days a week and twice a day. Early 3pm-6pm daily, nights change. More details and menu here. Cheap beer and less expensive food sounds good to me. 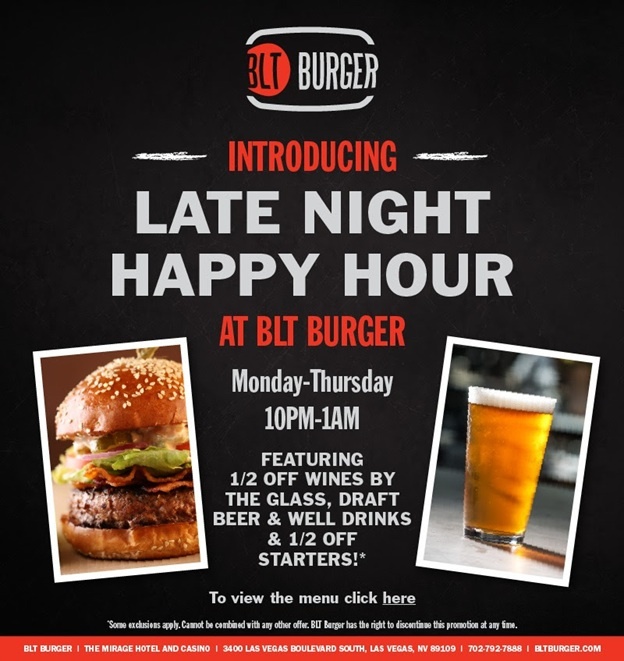 Happy Hour on the Vegas Strip usually starts before the sun goes down but this late night Happy Hour At BLT Burger at The Mirage is from 10pm-1am. That’s the right time for cheap beer as far as most people are concerned. I’ll probably grab the cheaper beer and pay full price for an awesome bacon cheeseburger the next time I’m at BLT Burger. 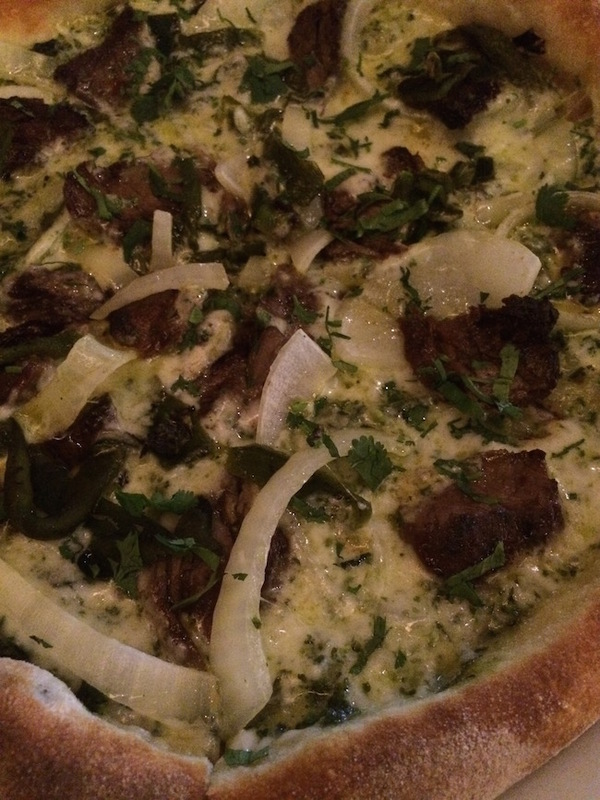 I rarely visit the same bars and restaurants with the regularity I do Pizza Rock. 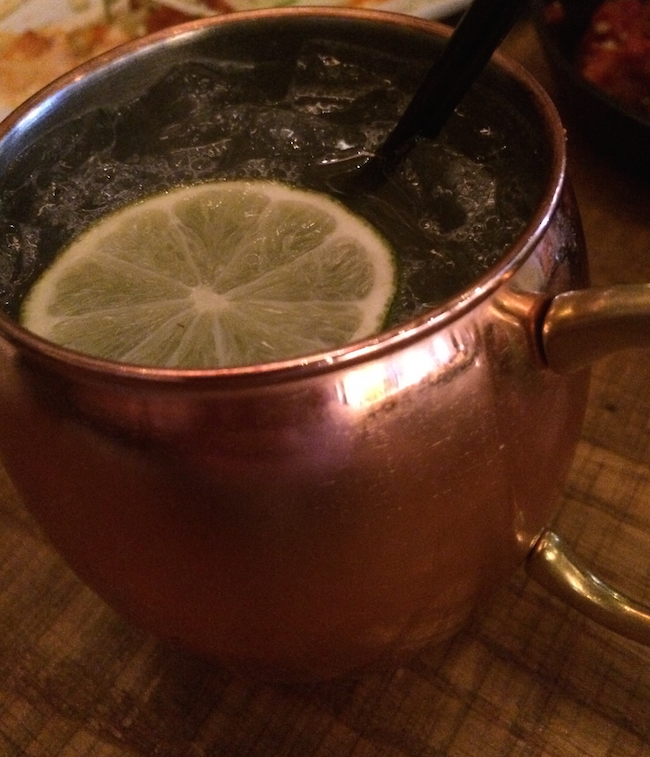 There’s just so new many bars and restaurants opening that it’s fun to try something new. With that being said, Pizza Rock has become my go to place to meet people in Downtown Vegas. 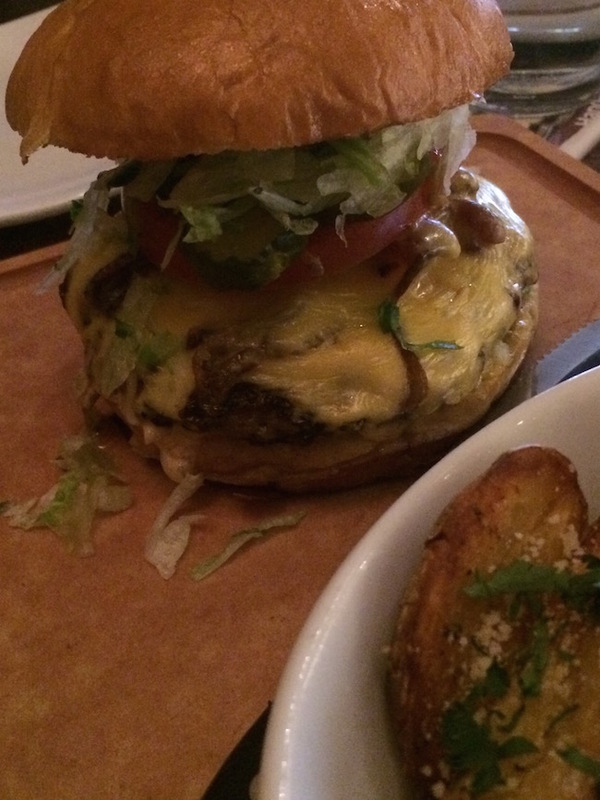 You already know I think the Pizza Rock burger is the best in Downtown Vegas. My little crush on Pizza Rock has already detailed. I’ve been looking at the Pizza Rock 3-5-7 Happy Hour since they opened and never found an excuse to go until a few weeks ago. I had a couple of hours until my next appointment so I figured that there’s no better way to kill time than to drink good beer on the cheap. Well drinks are $3 for the 3-5-7 Happy Hour and food is either $3, $5 or $7. The real winner here is the beer drinker. All draft beer is the $5. This discounts some of their already great priced micro brews even further. 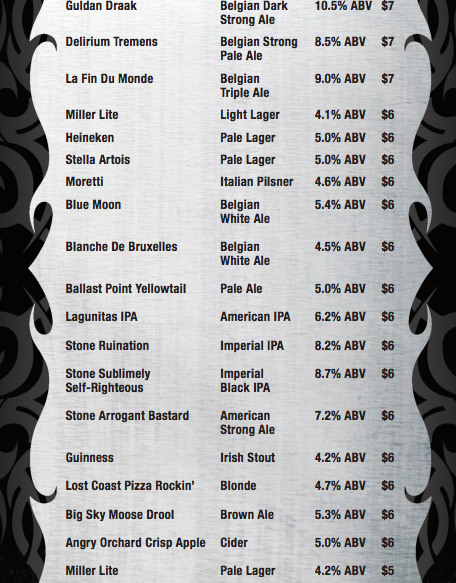 Take a look at the menu which is missing some of the rotating seasonal or micro batch beers that rotate. The prices for the smaller brews are fair at all times of the day but a $5 Delirium Tremens is fantastic. Not only won’t you find Delirium Tremens at many bars but you won’t find it for the regular $7 price and you definitely won’t find it for $5. The beer above was something from the Lips of Faith series from New Belgium brewery. It was super sour and something I wouldn’t have tried unless it was $5. I’ve never had a beer like that so I’m glad that I tried it. 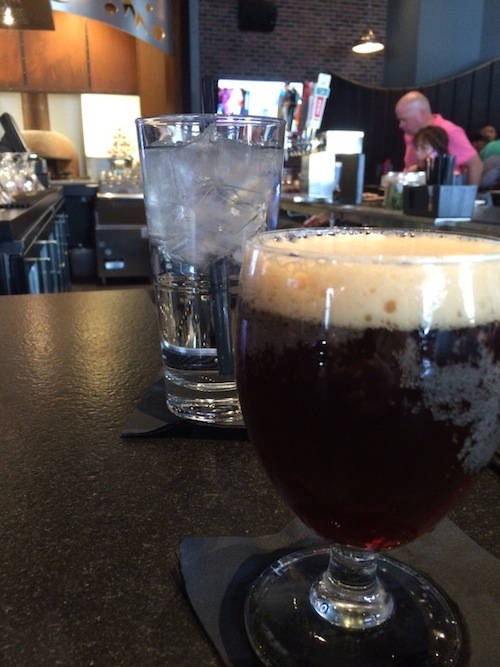 It’s one of the draft beers that was on rotation at the time, so it may not be on draft when you visit. I point out Delirium Tremens because it’s one of my favorite beers but there are plenty of great beer options at Pizza Rock. If you’re hungry you can have an excellent meal and beer for $10. That’s pretty, pretty good. You can find cheaper drinks and food in Downtown Vegas but you won’t find prices that match the quality of beer and food you’ll get at Pizza Rock during happy hour. This is a great excuse to get out of the casinos for a little while and get some fresh air. Note, Pizza Rock also has Craft Happy Hour from 10pm-2am that I always seem to forget about. 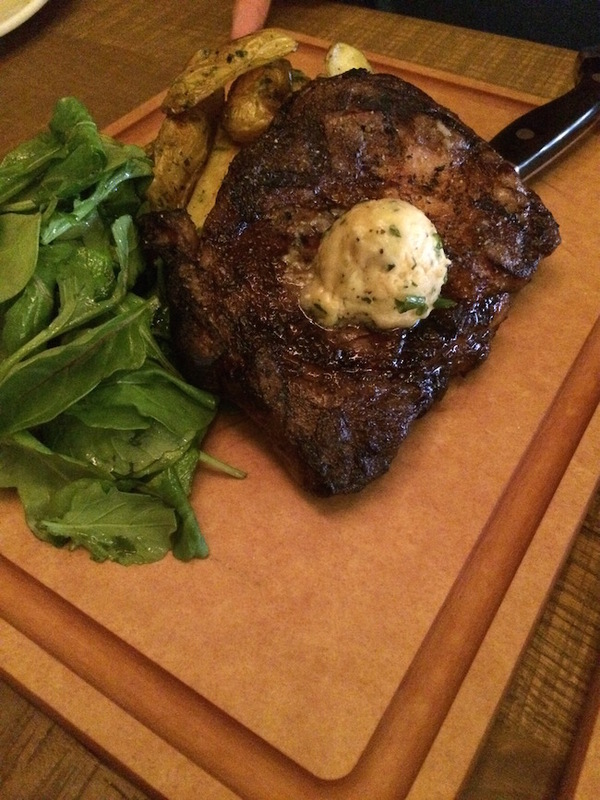 You may remember the blogger meat up I wrote about last year from Ranch House. 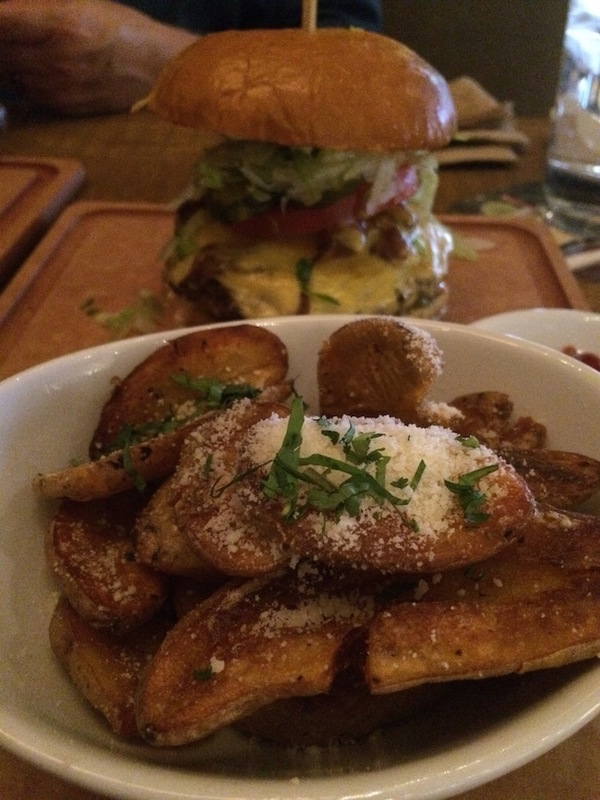 These meetups are always a good time with good people and sometimes include good food and good drinks. This time it was all of the above. We met up at Trevi which is inside the Forum Shops at Caesars Palace. 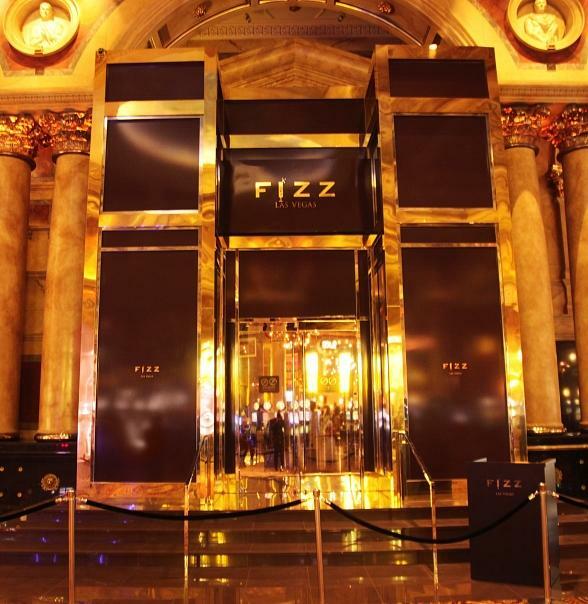 Trevi is one of the first restaurants you’ll see when you walk into the Forum Shops from the Caesars Palace casino. I’ve been to the Forum Shops over a hundred times and never noticed Trevi but I’ve walked by it every time I’ve been there. To my defense I’m usually in a rush heading somewhere in the netherworld deep inside the Forum Shops. I get lost almost every time I’m at the Forum Shops because I don’t pay close attention and I’m not directionally inclined. Back to Trevi. 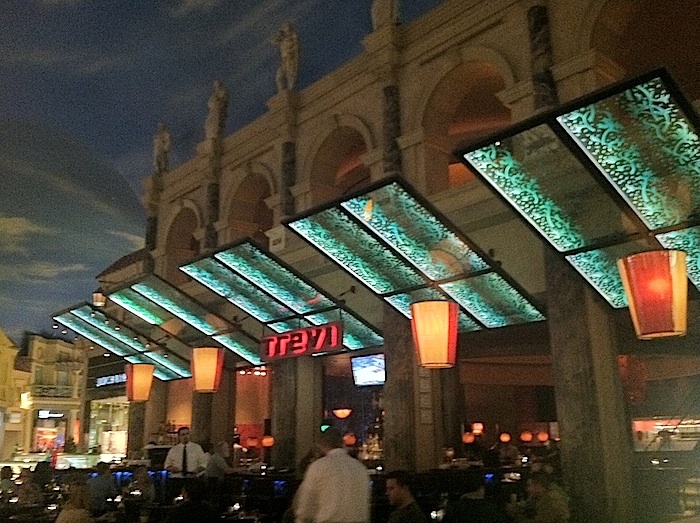 Trevi has dining inside and “outside” of the restaurant. The “outside” dining is a fenced of part of the forum shops which seats you close to the pretty fountains. If you sit too close to the fountains you’ll realize how loud they can be. The airy feeling is nice but head inside if you don’t want to be seen or would prefer less noise. 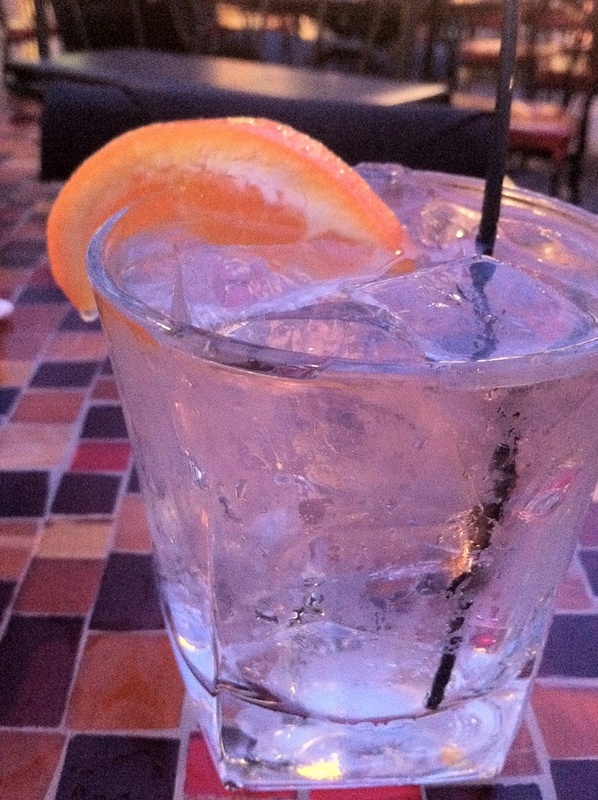 While everyone else was sampling the fancy cocktails or some wine I decided to fix a craving I had with a perfectly made Grey Goose Orange and Soda. This picture looks so good that I want two or three more like I had at Trevi. Right. Now. This was the perfect way to begin the night. We ate family style and the first course brought the excellent meatballs at the top of the page and this very cool chicken parmesan appetizer. What could make chicken parm cool? 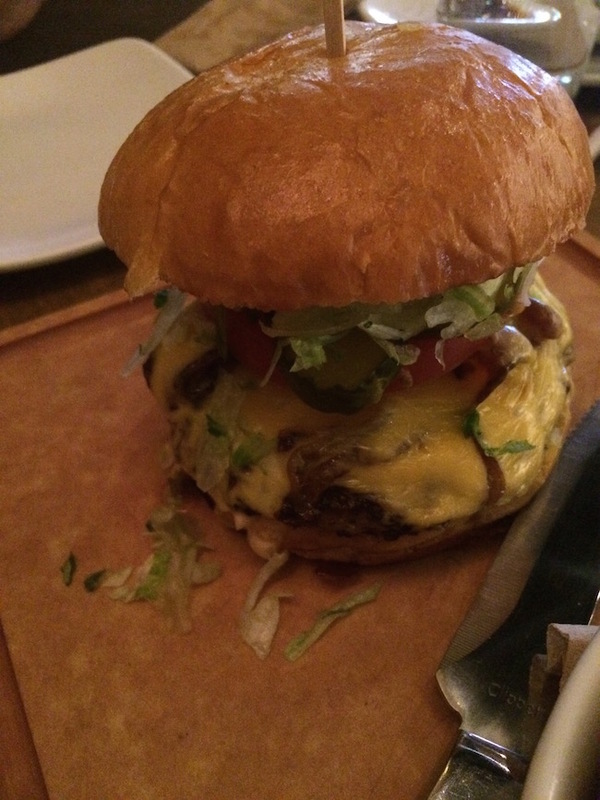 Look at the picture…the cheese is in the middle. 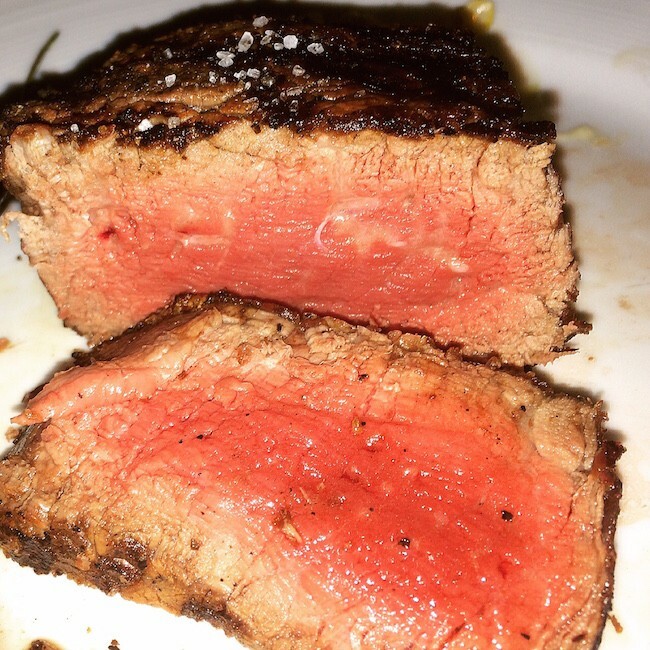 There was little sauce which is just the way I like it and this made the dish very neat and easy to manage. That’s not always the case with chicken parm. 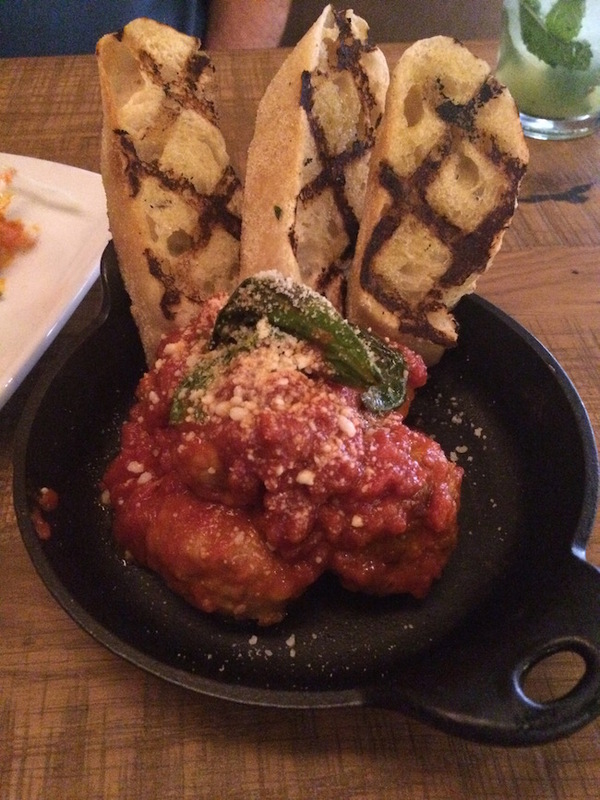 Between the meatballs and chicken parm I barely touched the main courses. 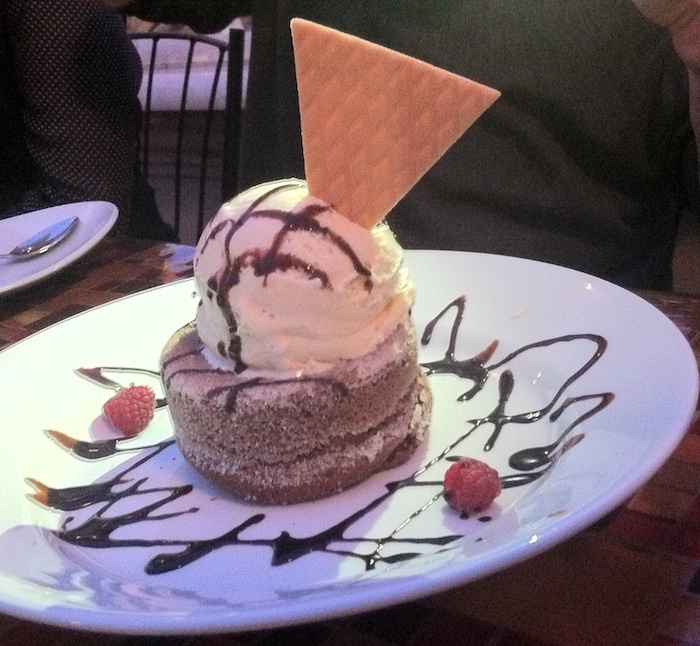 I wanted to keep room for dessert and I dipped into something called gooey chocolate cake. The outside may look dry but when I dove inside and grabbed some of that hot fudge everything was all good. The fresh berries made for a perfect palate cleanser. The small plates above shared with a friend would make for a perfect happy hour. 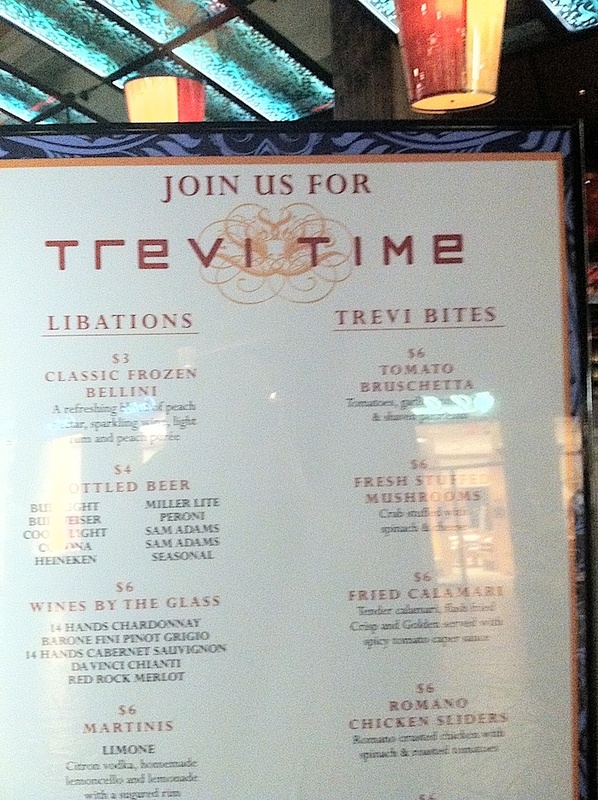 Trevi’s happy hour is called Trevi Time and they offer similar plates for $6. Not bad. 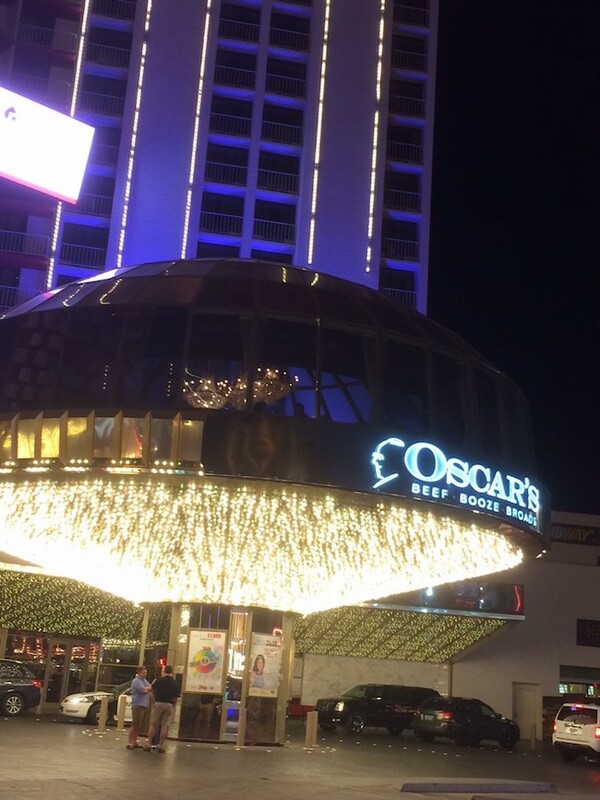 This wasn’t an ordinary day on the Vegas strip. You may remember the tragic shootout last week where three people died and a car blew up. That closed part of the strip so I decided to cut my travel during the day in two. This is why traffic didn’t seem too bad. 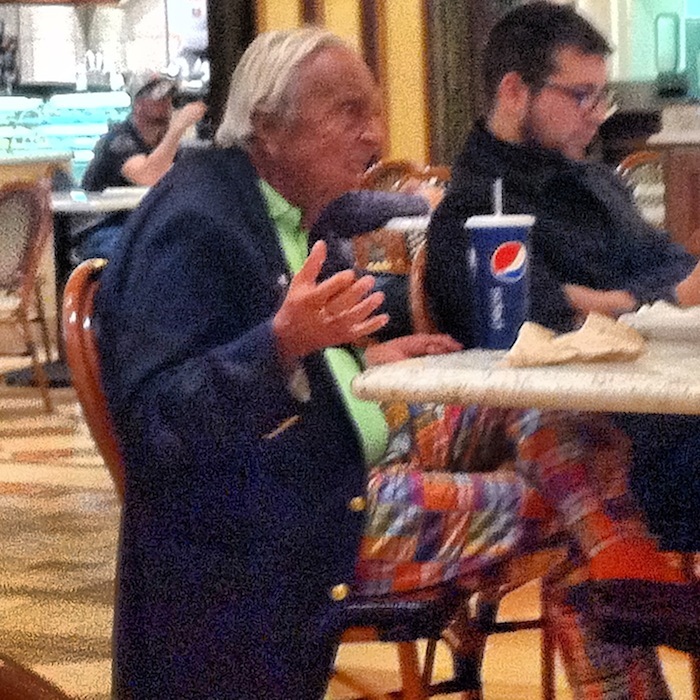 I worked from The Venetian food court for a couple hours before heading to dinner. While drinking one of the best latte’s ever I noticed this incredibly animated dude sitting across from me. Unfortunately he took off shortly after I took this picture and we didn’t meet but I think I’d like to play craps with him some day. Note: The food and drink were complimentary but my thoughts are my own. 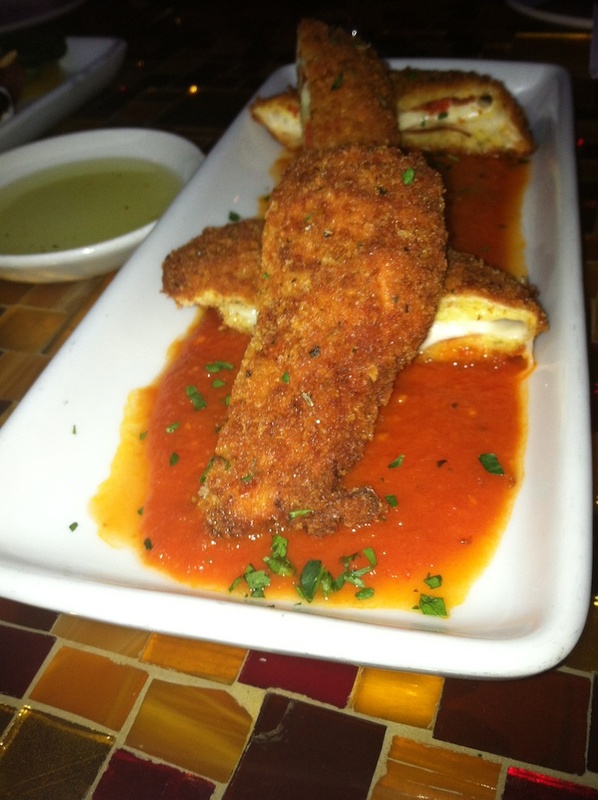 If you want to see more pictures from dinner at Trevi, check out the tumblr. Last Friday, after my mini-vacation, I headed over to Red Rock Casino for happy hour at LBS Burger and the Lifehouse concert. I had a little time to kill so I decided to play a little video poker. Go figure. I had a few bucks leftover from my trip to the strip so I decided to play dollars. I mix up my pay between quarters, fifty cent and dollars playing Jacks or Better unless I’m bored and want to give a random game a shot. After learning that Station Casinos no longer serves Captain Morgan Spiced Rum, I decided to grab my tickets and head over to check the pool area for the show. I realized I had a few minutes to kill so I sat down at a machine by the door and played another $20. That turned up four 8’s. Up another $40 or $60 I decided to head into the show – for real this time. 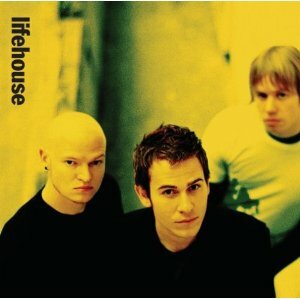 In case you’re not familiar with Lifehouse they’re one of those pop-rock bands that you hear pretty often and never know who they are. Thanks to Lifehouse I hit a Royal Flush. That may be my lasting memory of them.